When we came to this area, beaches are difficult to find. Instead, we turned our interest to what Guánica is famous for: the United Nations Biosphere Reserve named the Guánica Dry Forest. This preserve we found, is the “top” birding spot on the island. There are now 134 species recorded here. This is Puerto Rico’s rocky coast, along the Caribbean Sea. Good beaches are hard to find, but here are a couple of nice ones. But dead sea grass collects along the shore, making it sometimes for a smelly beach, and we found the water a little cloudy. 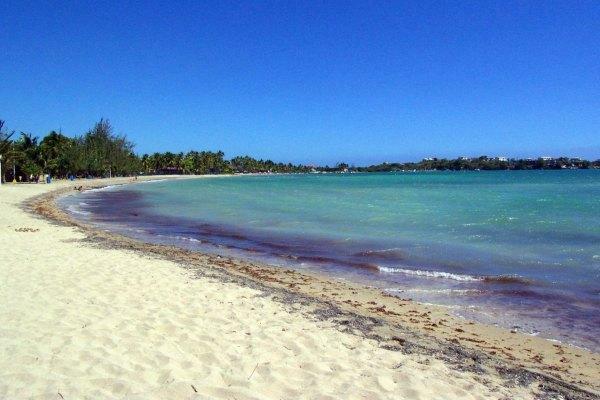 So Plaza Las Delicias, Cana Gorda wasn’t one of our favorites – but it’s a nice beach nonetheless. It’s nature at its best, and sometimes that combination can have beauty and not so beautiful side by side. Still, don’t miss this area. 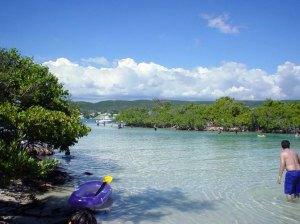 Spend some time and find out what people are excited about around Guanica. In the Porta del Sol area, just west of Ponce, one our favorite cities for getting away from the beach – it has those beautiful colonial buildings and streets that take you back – well, only a half hour drive from Ponce is the quaint Plaza Las Delicias, Cana Gorda balneario. It’s right in front of that United Nations Biosphere – Guánica Dry Forest Reserve. Guánica isn’t a loss, however. Catch the Gilligan’s Island ferry out to Gilligan’s Island – about a mile offshore. The mangroves and channels packed with tropical fish make snorkeling here top notch. The sand flats will make you pull the towel out and lay in the Puerto Rican sun, and we found this is the locals’ hang out over the weekend. They fire up small grills and have a nice, relaxing time on Gilligan’s Island. The ferry is only $6.00 and leaves from the Copamarina Beach Resort.